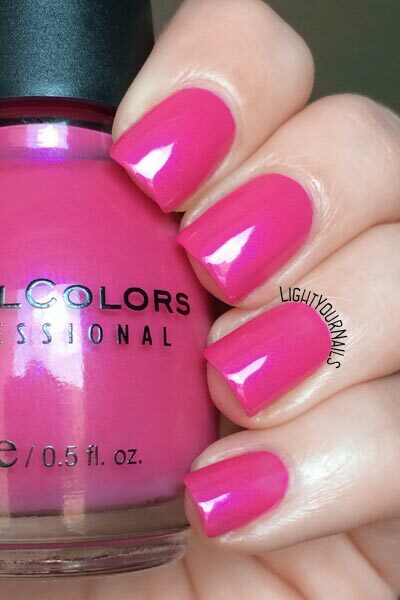 Sinful Colors Oasis | Light Your Nails! The sunny season hit us and I really feel like wearing more bright colours, or neons, on my nails. Today I picked a pink nail polish: Sinful Colors Oasis. It’s almost a neon pink, with a lovely tone-on-tone shimmer, and in some lighting it looks purple, too. Application is easy and you can reach full coverage with three coats of polish. Drying time is not that fast so you’d better use a fast drying top coat to help. Molto bello ed estivo, vero? Lo indossereste? Tra l’altro adesso c’è una promo OVS dove il terzo smalto (meno caro) si paga 1 cent, e Sinful rientra tra i brand in offerta se vi può interessare! Gosto muito de Sinful colors, esse tá lindo. E' bellissimo questo colore ed è anche senza top coat! Mi piacciono le sfaccettature sul viola che ci sono alla luce! Voglio vedere se riesco a sfruttare questo sconto che hai detto, grazie della dritta! Grazie Manu! E' una bella offerta secondo me! Oooo I think I have this one hiding in my collection somewhere. Need to pull it out! It's the right time for it! I've recently started getting more into pinks like this and think it suits you nicely! I recently bought a bunch of Sinful Color polishes that have flakies in them and may pick this one up. Sinfuls are so good for their price! I agree Kerry! I purchased it for seeing it in the bottle and fortunately it translates to the nails! I would definitely wear this, I love pink polishes. man, I miss finding SC in my local stores. This is such a pretty shade. It's a shame indeed Nichole! It's so wonderfully bright! It reminds me of big Hawaiian flowers. Ohh yes! That's a good one! How do I not have this one?! It's beautiful on you! Ohhh, I'm usually not into pinks but I like the shimmer in this one! Oh I love this! I need to find a drugstore that has a better SC stock! Me, too, to be honest! I wished they had the whole range!